What could be more fun than to own one of the many varieties of the teardrop camping trailers? Although it is unclear as to whether the first teardrop trailers were home-built or commercially built, it has been recorded that the teardrop trailer made its debut in 1936. These single room trailers held a kitchen and a combination living-dining room. The idea was to have a place to live as you traveled along the road. Some people actually used the trailer as their home because both building it and living in it was cost-efficient. Many, who made their way out West, traveled and lived in the tiny trailer as they found work along the way. From 1936 on, the craze for teardrops has not diminished. 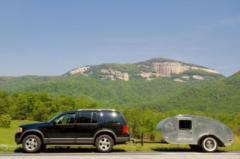 Today owners hold teardrop gatherings across the United States. The following show some important dates in the history of building teardrop trailers. An article written in 1936 called The Ideal Outdoorsman's Trailer explained how to construct a teardrop trailer. These very first trailers were constructed out of plywood. The light-weight trailers were only about ten-feet in length. One version had only one wheel, known as a uni, and was attached to the rear bumper of a car. It was used mainly for hauling loads. When the 1950s rolled around, the ideal situation was to own a teardrop, stock it with canned and dried goods and bedding, and within minutes you would be able to set out on a weekend trip. Once you reached your campsite, you would be immediately ready for adventure because there would be no need to take time to set up a tent. Campers could jump right into hiking on a trail or could cook up something on the Coleman 425 Camping Stove. If you don't want to build an RV or search for a vintage one, there are a few new teardrops on the market now, all based on the older models of the 1940s and 1950s. To get an idea of their size and characteristics, here is an example of one called the Camp-Inn, a modern version of this nostalgic style RV. It can travel just about anywhere and is sure to provide you with lots of convenience and fun. 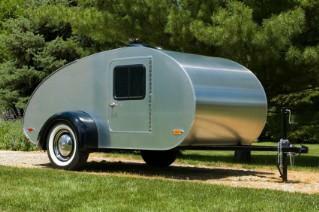 Camp-Inn teardrop trailers are built in Wisconsin. Their exterior is fashioned of aluminum, though the fenders are crafted from stainless steel. The interior features real birch fixtures. The legacy of teardrop camping trailers is a fascinating component to American history. Join those who enjoy preserving that history by learning more about the teardrop. You may even become so engrossed that you will want to build or purchase your very own trailer.